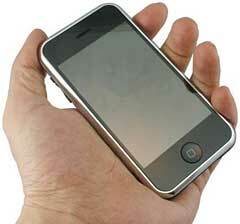 3G iPhone to Outperform Broadband Networks? "As a result, people stand in line in the early morning hours to buy an Apple product that's going to be outdated in a few weeks. So what? They just want an iPhone to give as a graduation present, and that's what's for sale...."
"While the summer 2008 emergence of a second-generation iPhone running on 3G network technology might well be the year's worst-kept secret, it remains to be seen just how much of a 3G performance boost is handed to Apple's iconic handset when compared to its existing reliance on the sub-standard 2.5G EDGE network. "If a related report emanating from Australia is to be believed, then the highly anticipated arrival of the 3G iPhone won't just result in data delivery speed dwarfing that of its EDGE-based counterpart but also potentially out performing the majority of existing broadband connections." Link: 3G iPhone to Outperform Broadband Networks? "In reponse to reports that personally identifiable private information can be easily swiped from used iPhones sold on eBay, the tireless Rich Mogull has cooked up a nifty way to wipe data from iPhones. "Mogull admits his process is 'not perfect' but it does look to be an easy way to overload the iPhone with music files to force an overwrite of the device's storage. The Securosis.com consultant recommends the steps are followed multiple times, with multiple music playlists to make sure the device is wiped properly." "There's one thing that would make the iPhone just a touch more awesome. Media streaming. The Holy Grail would be to directly send music from your iPhone or iPod touch to Apple's Airport Express, the little Wi-Fi brick which lets you stream music wirelessly to your stereo. Sadly, you can't. But there are workarounds, ways to send music to and from your iPhone through the air, either from your computer or straight from the Internet." "Employees at Apple have filed a patent for integrating solar cells into portable devices by placing them underneath the layers of a touch-sensitive display, according to the filing. "Solar power could help make devices truly portable, freeing from the need for wires to connect them to a power supply." "The battery life of portable gadgets has always been a source of frustration. But Apple may have found an eco-friendly way around the problem - by integrating a solar panel behind, say, the iPhone's LCD display. "Apple has filed a patent application for the integration of a layer of solar cells below a gadget's LCD display. Essentially, sunlight passing across, say, the iPhone's screen could be soaked-up by the solar panel beneath the LCD and then turned into useable power for the phone." "There is something about human nature that compels us to challenge ourselves. It's as if evolution itself coalesces into corporeal form to drive us forward; clinging to our backs as it whispers sweet rewards to tempt us into actions to prove we are worthy of our place on this planet. For some, these temptations burst free with creative impulse resulting in works of art, literature, or entrepreneurship. For others, especially young males, these temptations lead to dangerous physical follies involving beer. And those individuals with exceptional skills, experiences, and capabilities demand even more extreme challenges. Challenges that risk their very survival. "I've been trained to survive some of the harshest, most dangerous conditions in our world short of combat. As a former paramedic and firefighter with over a decade's experience in mountain rescue, I'm confident in my ability to handle everything from natural disasters to run-of-the-mill survival situations from the ocean, to the desert, to the mountains. But nothing could prepare me for my latest challenge . . . surviving 5 days on vacation in California with only my iPhone; leaving my trusty MacBook Pro at home." "But that got me thinking: how difficult would doing so be? With some smart shopping, could you create a system - an amplifier, an iPod dock with remote, and speakers - that competes on both price and performance with the best systems specifically made for the iPod? "I decided to find out...."
"Color me impressed. I'm almost embarrassed to take my iPhone out in public right now, given the sad, soiled state of overuse that its cover has fallen into. Now, not only do I have a replacement option that appeals to my loud primary color sensibility, but that is recyclable! I'm sure that many more cultish Apple fans will tell me these have been out for a while, but I didn't know about them! "The case, which is available for current iPhone and iPod models, is called Shades from ShadesCases." "Sitting at the perfect, if somewhat niche, intersection of Windows Vista and Apple iPhone fandom is this: VistaPerfection 2.0. "Independent developer Spec-Works has released VistaPerfection 2.0 to ModifyMyPhone, an iPhone site covering hacked and unlocked devices, that lets you give your iPhone that unmistakable Vista-look-and-feel. Fortunately, that's all you'll get, as VistaPerfection 2.0 won't put Microsoft's resource hog on your precious little device. "It can't be . . . it is, kinda"
PR: nova media announces FoneLink 2.0, their cell phone suite for Mac OS X. Most cell phone manufacturers do not offer a Macintosh solution, but nova media bridges the gap with FoneLink 2.0. The cell phone suite offers a familiar Mac-like solution to exchange files, synchronize data, manage SMS text messages and to backup and restore cell phone contents. nova media announces FoneLink 2.0, their popular cell phone suite for Mac OS X. Most cell phone manufacturers do not offer a Macintosh solution, but nova media bridges the gap with FoneLink 2.0. The cell phone suite offers a familiar Mac-like solution to exchange files, synchronize data, manage SMS text messages and to backup and restore cell phone contents. FoneLink supports drag and drop throughout its new user interface and offers an activity monitor to display current and cued actions. The improved sync-manager now includes built-in support for Apple's Sync Services technology to sync with Entourage, iCal and Address Book along with other Sync Services-savvy applications. "FoneLink 2.0 is completely rewritten. It is fast, reliable, and offers a Bluetooth assistant to pair a cell phone to the Mac, if needed." states Jan Fuellemann, PR spokesperson at nova media. "FoneLink 2.0 supports many cell phones from Motorola, Nokia, Samsung and Sony Ericsson." FoneLink can automatically convert music, videos and photos on a Mac to formats that are instantly viewable and playable on the cell phone. iTunes playlists can be synchronized and a ringtone editor allows the creation of individual ringtones from any compatible music file. Last but not least, FoneLink has the ability to create a comprehensive backup of a cell phone's data in the background. If the mobile phone or its data gets lost or damaged, it is easy to restore individual data files using drag and drop, or to restore a comprehensive backup using the restore command. FoneLink 2.0 is a free update from previous version. It requires Mac OS X 10.4.9 or later and is priced at Euro 33,57 plus VAT (US-$ 33,57 plus VAT for customers in the US and Canada). FoneLink is available for download today at nova media's website. If you would like an iPhone for your kids or you need an iPhone for display purpose, then this maybe a good choice for you. This dummy display phone is made of high quality OEM materials, it is exact replicas of real live working phones that you would find in a retail store.